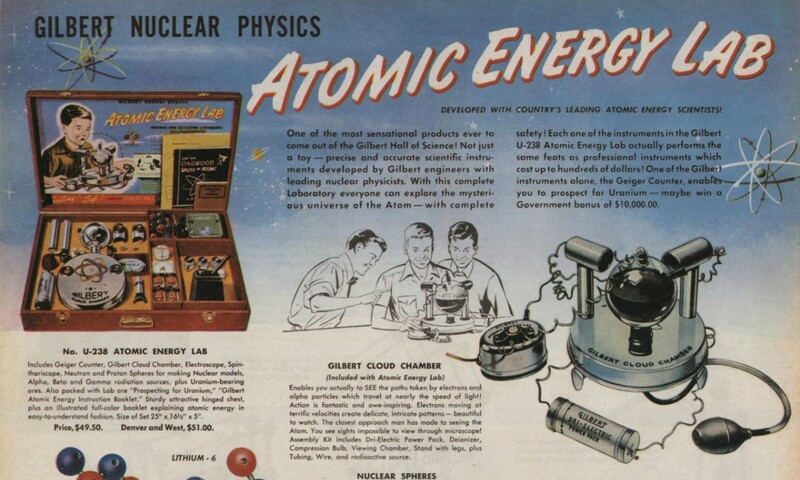 Playing With Radiation: The 1951 “Atomic Energy Lab” — For Kids! The years following World War II were a glorious time for many Americans — financially speaking, anyway. There was a great wave of prosperity for middle-class working people, and the notion of a consumption-based society was just taking root. The market flooded with new, high-tech products that could now be produced thanks to the end of the war effort. New space-age gadgets like high-tech refrigerators, televisions, and push-button cars were now common. Kids especially saw an explosion of products aimed at them — from weirdo candies to kid-friendly TV shows to prepackaged cowboy playsets — which middle-class parents could now afford. Not a lot of regulation was applied to these toys and food products… and some of the toys sold in this era were downright dangerous. This was a time, mind you, when little kids were allowed to own their own guns (Bob Clark’s A CHRISTMAS STORY wasn’t entirely fictional, you know). 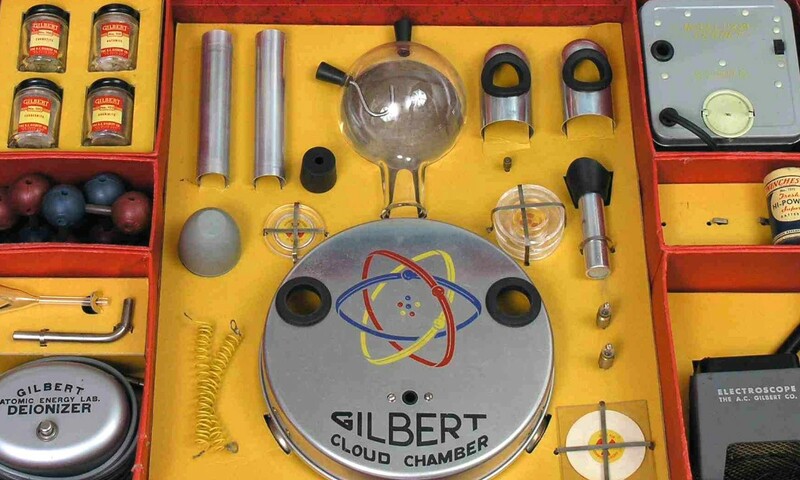 Many toys from the ’50s were covered in lead paint, possessed plenty of sharp edges, and in the case of the infamous Gilbert U-238 Atomic Energy Laboratory, real radioactive isotopes. Released in 1951 and sold for a whopping $49.50 (which is almost $500 in 2017 dollars, adjusted for inflation), the Atomic Energy Laboratory has gone down in history as one of the most dangerous children’s toys ever produced. The idea behind the toy was similar to that of the well-known chemistry set — kids were encouraged to use the enclosed gadgets and chemicals to explore chemical and nuclear reactions in their homes. It was an educational product that encouraged young engineers to realize their interests and potential. It’s no wonder that the Lab’s inventor, A.C. Gilbert, also invented the Erector Set — he clearly wanted kids to be interested in science and engineering… and radiation. 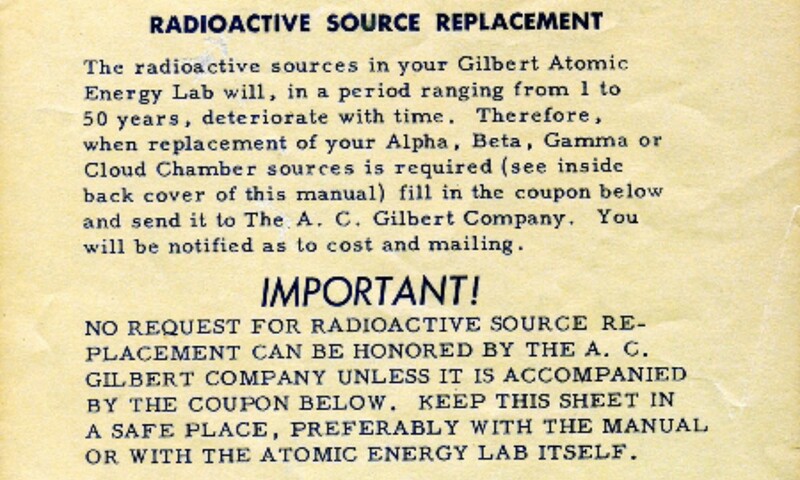 The Gilbert U-238 Atomic Energy Laboratory came with its own Geiger counter, an electroscope, a spinthariscope (which is — and I had to look it up — “an instrument that shows the incidence of alpha particles by flashes on a fluorescent screen”), a glass sphere particle detector called a cloud chamber, and — perhaps most controversially — four samples of actual radioactive ore, saturated with uranium. Each sample came from a different source, so their particle density would be different, and running them each through the Lab would warrant different results and effects. 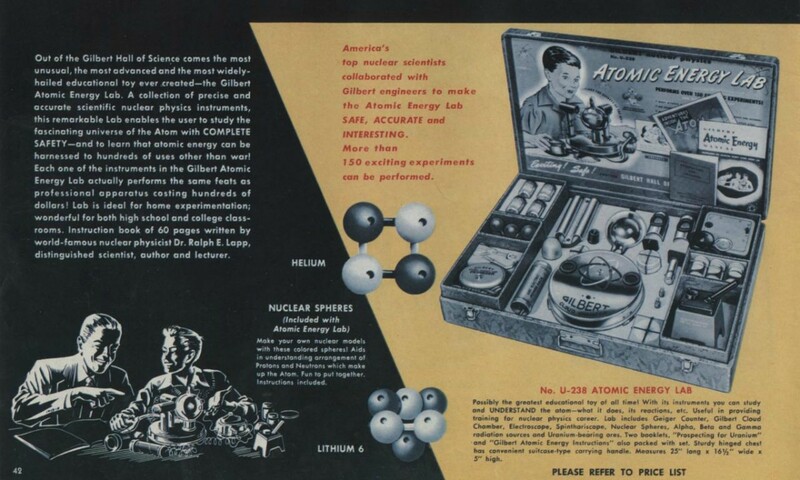 The set came with awesome-sounding widgets, glass jars, and arcane sounding machinery with great names like the “Dri-Electric Power Pack.” Tests for Alpha particles, Beta particles, and Gamma rays were included in the kit, which featured an instruction booklet hosted by none other than Dagwood of Chic Young’s BLONDIE comic strip. Also, if a kid was able to use his kit to locate more uranium for the U.S. government, they were promised $10,000. As you can see, this toy was far more sophisticated than your average chemistry set. Most home labs — a pretty common toy — were meant to introduce kids to certain sciences, and featured experiments like making blue liquid turn clear. 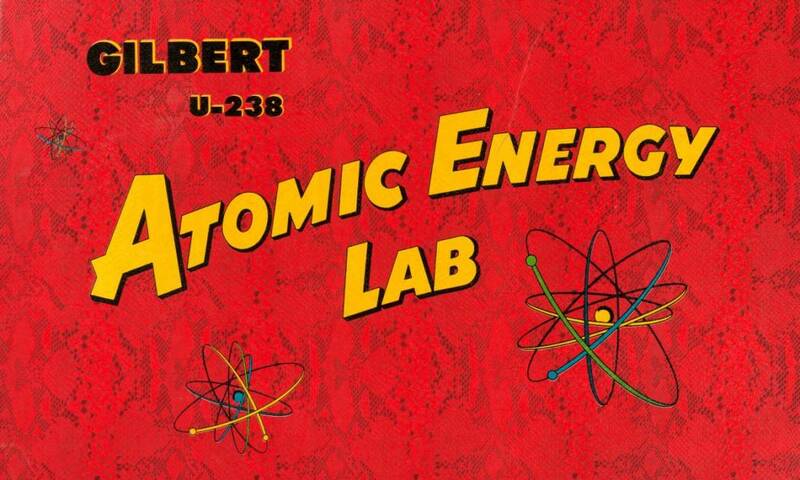 The Gilbert U-238 Atomic Energy Laboratory was meant for older kids — maybe high school age — who were already acing their chemistry finals and wanted to take their home tinkering to a new (and potentially dangerous) level. A gag often seen in cartoons and sitcoms involves a young child blowing up their toys with a chemistry lab… but imagine the damage one could do with actual radioactive isotopes. Radiation wasn’t well-understood by the public in the 1950s — even in the wake of the explosion of an atomic bomb. As a nation, we were still learning what all this radiation really meant; we didn’t understand how safe or unsafe it might be, or what could and couldn’t be done with it. This confusion can be seen in pop culture of the period — movie monsters of the ’50s were often spawned by radiation and atomic bombs, and comic book superheroes were gifted fantastic powers through radioactivity. Gilbert clearly sought to bridge that knowledge gap, allowing kids to try out radiation for themselves, and remove the Godzilla-sized stigma attached to it. Gilbert claimed that he worked with nuclear physicists in making the Atomic Energy Lab, and assured buyers that it was 100% safe. 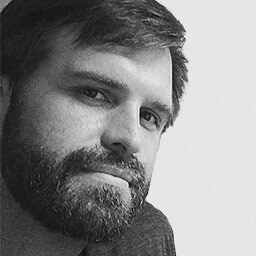 But while Gilbert was interested in engineering and the sciences, he was a businessman and a successful toymaker first (he was also a magician), so he knew how to spin something negative when it needed spinning… and many modern skeptics aren’t sure how “safe” the Atomic Energy Lab actually was. It did, after all, contain radioactive rocks. Some people better versed in atomic energy sciences than I have pointed out that the polonuim sources of the ore samples may have left them more radioactive than Gilbert perhaps intended — leading to some potential poisoning problems. It’s generally agreed that if a child were to pulverize a radioactive ore sample and accidentally ingest the dust, they would not acquire super-powers… but instead become super-sick. The Gilbert U-238 Atomic Energy Lab was staggeringly unpopular — probably due to its steep price — and most of the units had to be sold back to the company. Not everyone was chagrined, however — evidently Columbia University bought five of the units for their classroom lessons. Used copies still sell on eBay to this very day, so if you have some active ore samples, you can give it a try, assuming it still works… and surely there’s nothing dangerous about feeding isotopes into 66-year-old children’s toys, right? Either way, it’s certainly not a way to turn your cat into a 50-foot man-eating monster. The Lab was only on the market for a few years, I was not able to find any evidence of kids dying or being poisoned by it, and there were certainly no incidents of explosion. But this radioactive toy was perhaps one of the most dangerous and foolhardy ever put to market. If you are planning to muck about with radiation, you should perhaps have a more controlled environment than your a high school kid’s bedroom. 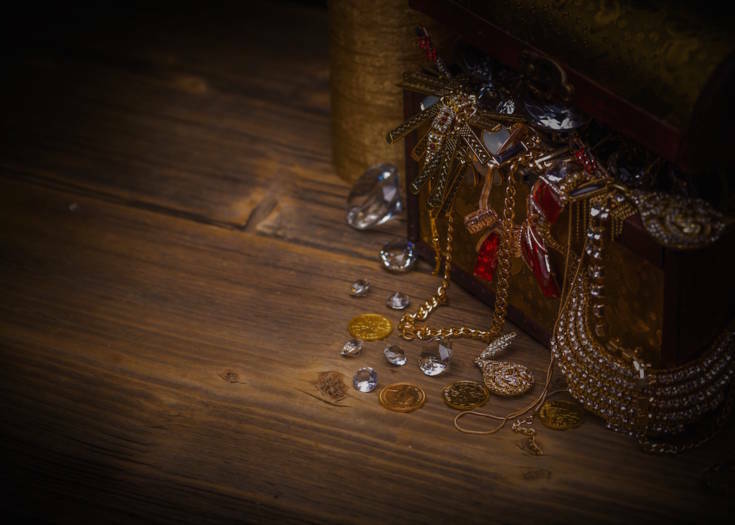 Previous Story Can You Solve the Deadly 300-Year-Old Cryptogram of Pirate Olivier Lavasseur? 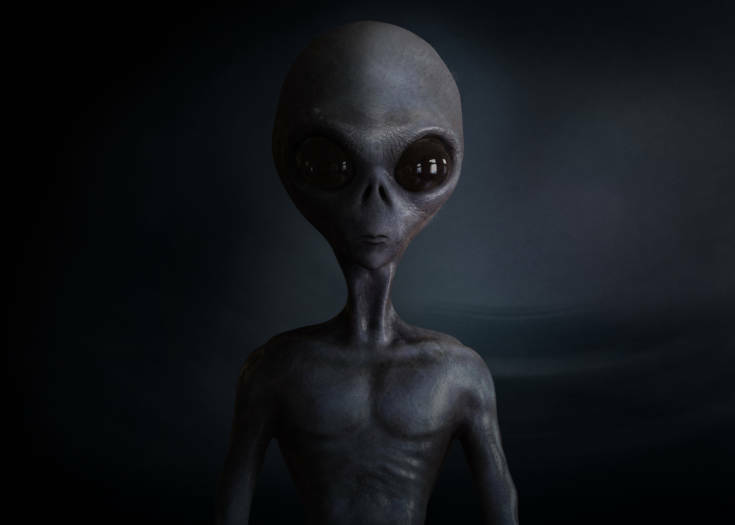 Next Story Dead Ned: Is A Deceased Alien Buried In Texas?